The US Departments of Defence (DoD) and State Department, in a recent joint report to their Congress, said, "We see a growing convergence with India on our strategic outlook for the region, and we view India as an increasingly important regional security partner within and beyond the Indo-Asia-Pacific region." This was immediately post Prime Minister Narendra Modi and US President Donald Trump agreeing for the two countries elevate their strategic consultations. On August 15, 2017, President Trump called up PM Modi to congratulate Indians for their Independence Day. As a follow up to this conversation, a White House communiqué disclosed that both leaders also "resolved to enhance peace and stability across the Indo-Pacific region by establishing a new two-by-two ministerial dialogue that will elevate their strategic consultations." Significantly, the White House statement came hours after Trump ordered a review of China's trade practices. 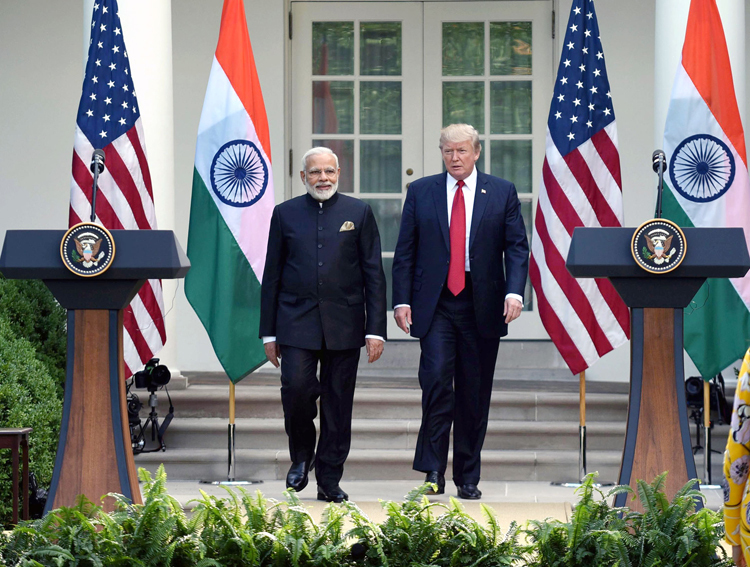 The White House communiqué also highlighted the geo-political alignment between the two countries and the US becoming and continuing to be a reliable, long-term supplier of energy, the first ever shipment of US crude oil to India already having kicked off from Texas. Both India and the US are presently busy scheduling the first meeting of the newly established "2+2" format, of the defence and foreign ministers from each side. This new high-level mechanism will be in addition to the strategic and commercial dialogue that is an annual feature between the two countries. The two sides are also preparing for the forthcoming three-day Global Entrepreneurship Summit in Hyderabad, likely to be attended by Prime Minister Narendra Modi, with US President Trump's daughter Ivanka Trump leading the US delegation. On August 16, 2017, the US designated Hizbul Mujahideen (HM) as a "foreign terrorist organization", nearly two months after declaring the Syed Salahuddin, HM chief as a global terrorist. Though the designation slaps US sanctions on the outfit, it will not make much difference at ground level in Pakistan since the Pakistani establishment has intimately nurturing anti-India terrorist organization like HM – both army chief Qamar Javed Bajwa and ousted PM Nawaz Sharif have repeatedly HM terrorist Burhan Wani killed last year in J&K. But what matters is that the US decision marks a severe blow to Pakistan which has been projecting the militant group as a voice of Kashmiri people. According to the US State Department, terrorism designations expose and isolate organizations and individuals, and deny the access to the US financial system. Moreover, designations can assist the law enforcement activities of US agencies and other governments. It certainly bolsters India's position on terrorism and security in Indo-Pacific region. The US clamping down on terrorist outfits and their leaders inimical to India and elevating the bilateral relationship by adding a strong defence and strategic component to already existing operational and strategic underpinnings are clear indications of its South Asia strategy. Besides, the US action against Pakistan-backed terrorist outfits operating on Indian soil is also a moral indictment of China's position which has repeatedly vetoed all Indian attempts to blacklist these terrorists at the UN. Following the recent joint naval exercise Malabar 2017 involving the navies of India, US and Japan, the Indian and US Armies are scheduled to undertake the next joint exercise 'Yudh Abhyas' from September 14 to 27 at Joint Base Lewis-McChordin in the US; over 200 Indian Army soldiers will take part in the battalion-level field training exercise with a brigade-level command post, which will further boost interoperability between the two armies at the battalion and company level, and help our Army understand the doctrines, battle drills and procedures of the US Army. Admiral Harry Harris, Commander US Pacific Command, recently offered US help to India to modernize its military, saying that together they can improve India's military capabilities in significant and meaningful ways, adding, "I believe that the US is ready to help India modernize its military. India has been designated a major defence partner of the US. This is a strategic declaration that's unique to India and the US. It places India on the same level that we have many of our treaty allies." Significantly, over the past decade, the defence trade between the US and India has touched nearly $15 billion and is expected to gallop in the next few years, as India is looking at the US for some of the latest military hardware including fighter jets, Apache helicopters, latest unmanned aerial vehicles and naval platforms. At a joint press conference post the newly launched US-Japan 2+2 dialogue held on August 17, US Secretary of State Rex Tillerson said, "We will cooperate to advance trilateral and multilateral security and defence cooperation with other partners in the region, notably the Republic of Korea, Australia, India and other southeast Asian countries." Japanese Foreign Minister Taro Kono said, With ROK (South Korea), Australia, India and Southeast Asian countries, we will promote more than ever before cooperation in security and defence." The naked all round aggression that China is indulging in, calls for also countries like Vietnam, Taiwan, Singapore, Bhutan and Afghanistan being included in such multilateral cooperative arrangements. Geostrategic elevation of the Indo-US defence cooperation is a natural fallout of the dark shadows over the world being cast by the China-North Korea-Pakistan axis.